Amusement parks in Hong Kong are one of the many benefits this Chinese destination has to offer. Whether you are traveling to Hong Kong for business or pleasure, take some time to enjoy all the thrills, entertainment and fun available to you. 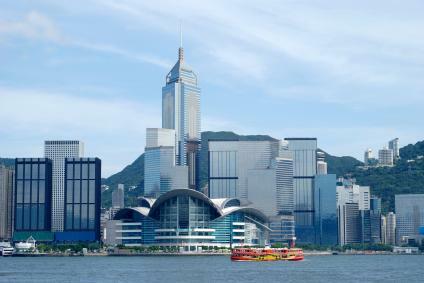 Hong Kong models many of its entertainment ventures after concepts already established in the West. So it should come as no surprise that it's home to Mickey Mouse and other familiar icons and amusements. As the smallest of all the Disney parks, Hong Kong Disneyland was still a hit when it opened. As amusement parks go, Hong Kong Disneyland is small enough to enjoy in one day. It is similar to the American parks with Fantasyland, Tomorrowland, Main Street and Adventureland. The Hong Kong resort includes one theme park and two hotels on its property. Hong Kong Disneyland features an impressive fireworks display each night that rivals their American counterparts. The cuisine of the park is primarily Asian food, including dim sum, sushi, chicken pies, noodle dishes, rice and fish balls. Authentic regional flavors take a cue from the China section of Disney World's EPCOT center in Florida. Homesick Disneyland fans can also enjoy an American grill menu at Hong Kong Disneyland's Royal Banquet Hall. Think Sea World if you plan to pay a visit to Ocean Park. Over 30 years old and one of the most established amusement parks in Hong Kong, it's home to both thrill rides and an aquatic zoo. Visitors board a cable car and travel over a mountain top to reach the park. This ride is included in the ticket price, and you should plan on taking an early car if you want to be there in time to get seats for their shows. Ocean Park is a great pick for families with young children, older adults or both, as there is something for everyone, and plenty of chances to learn about the world's marine life together. Hong Kong is also home to a duo of theme parks known as Ecoventure Valley and Tea Stream Resort Valley. They are a part of OCT East - an experimental ecological community that you can visit, explore and tour to experience all it has to offer. While others have replicated the idea, the property located in Shenzhen just north of Hong Kong is the original in innovation and entertainment. Self-described as a mixture of "suburban hillside and urban theme park", Ecoventure Valley is divided into five sections - Breakers Lagoon, Rapids Forest, Seafield Village, Adventure Canyon, and Peak Highland. Some of the novel experiences found in Ecoventure include a 4D theatre that simulates plunging into the ocean's depths, a waterfall flume ride eclipsed by the largest seashore waterfall in all of China, and a Cloud Bridge that allows you to see mountain and ocean at 360 degree visualization. The Tea Stream Resort Valley is home to Wetland Garden where you can explore multiple types of animal life and wander through groves of flowers. On the premises you will also find an amusement park with full-scale rides that all promote environmental protection and a Four-Season Botanic Museum where you can relax after a day of thrills. You may also choose to sightsee on a hot air balloon, or travel over to Ancient Tea Town where you can learn about tea making, shop, and enjoy more rides and entertainment. If you are traveling from overseas, it helps to know some Chinese phrases. However, many nationals will speak English, as it was considered a national language for the region until 1974, in addition to Chinese dialects. The websites of amusement parks in the region will also list prices in Hong Kong dollars, so you will need to calculate what the conversion rate will be before purchasing any tickets. Knowing how much your money is worth after it's exchanged will help you not overspend while on vacation. Finally, it can be extremely humid in China during the warm weather, so it's best to read up on the weather before you travel so you are adequately prepared. Hong Kong is small and very crowded, so public transportation is the best way to travel to your destination. Due to overpopulation, busses, ferries and trains are very affordable and convenient to use. There are no travel restrictions to passport-holding foreigners, and Americans are able to stay in Hong Kong for at least 90 days without a Visa. To learn more about Chinese culture and how to make your way through this famous city, consider visiting a Hong Kong tourism website prior to departure.